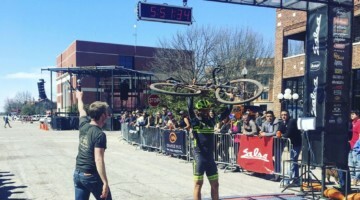 Last year, Lance Haidet and his Donnelly Cycling teammates rode the Pivot Vault frame for both cyclocross and some gravel racing. 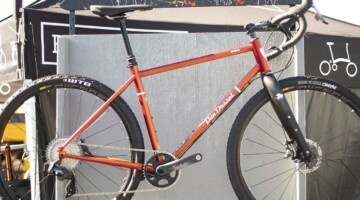 Earlier this year, we took what would be a last look at Haidet’s Pivot Vault with FSA K-Force WE electronic shifting. 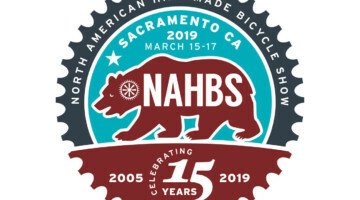 This year at the Dirty Kanza All Things Gravel Expo, Donnelly, best known for its line of cyclocross and gravel tires, announced it is going to start making its own bikes. 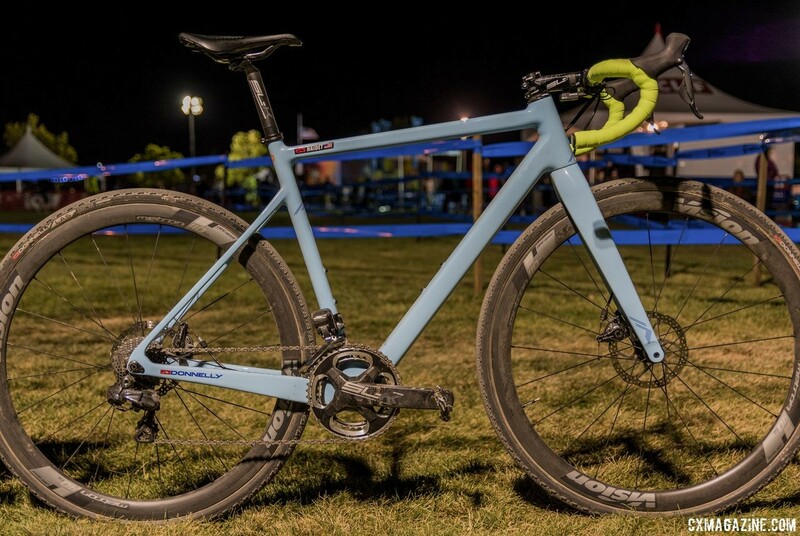 The G//C gravel and C//C cyclocross carbon framesets were on display in Kansas, and while there we took a closer look at the G//C model Jamey Driscoll rode for the 206-mile grind. 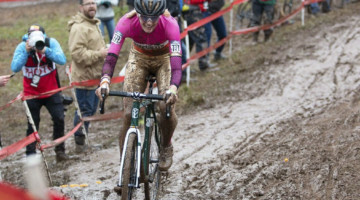 Donnelly’s new cyclocross frame is now out on the cyclocross course under Haidet, his teammate Laurel Rathbun and the Amy D. Foundation Elite riders Emily Werner and KK Santos. 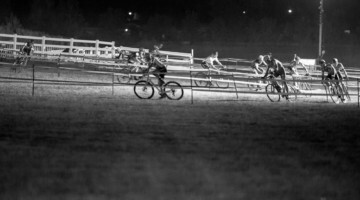 At the inaugural RenoCross, Haidet rode the new C//C to a win following a late attack initiated by his former teammate Driscoll. 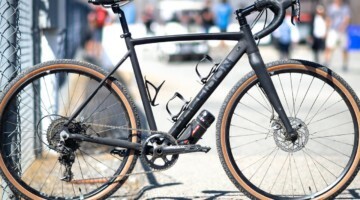 Lance Haidet’s Donnelly C//C carbon fiber cyclocross bike, RenoCross 2018. 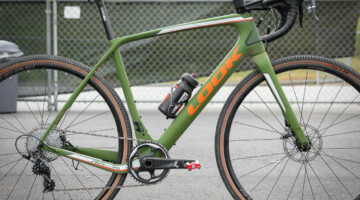 After Haidet’s impressive win, we took a closer look at the new Donnelly Cycling C//C that Haidet rode under the desert lights. 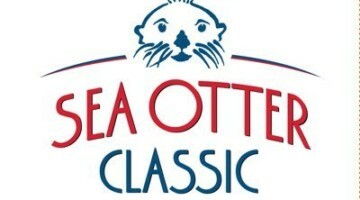 A lot has changed since we last checked in with Haidet at Sea Otter. 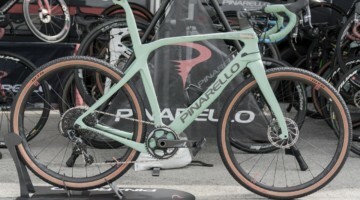 Title sponsor Donnelly launched its first cyclocross frame, and it is no surprise to see the team astride the new bikes. 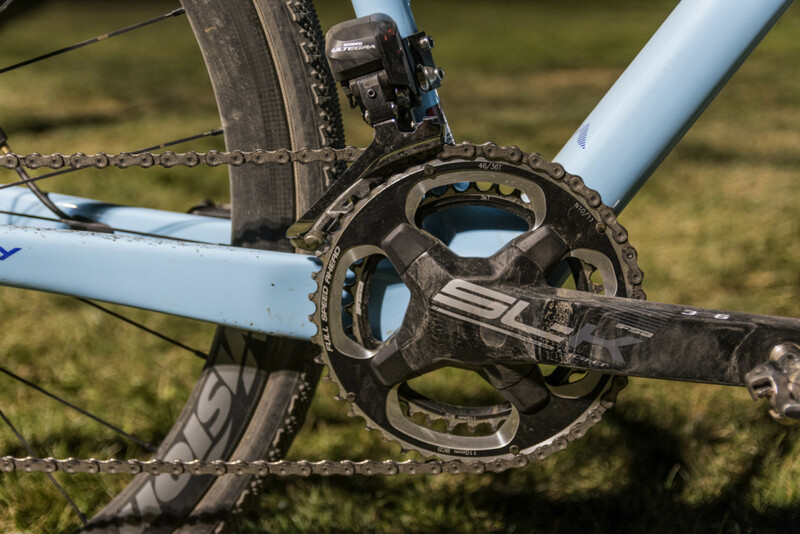 Additionally, while sponsor FSA seems to finally be ready to launch its long-awaited K-Force WE groupset, at RenoCross Haidet’s bike was equipped with a Shimano Di2 groupset. 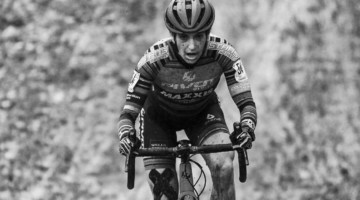 By Jingle Cross, he had switched the sponsor-correct K-Force WE groupset. 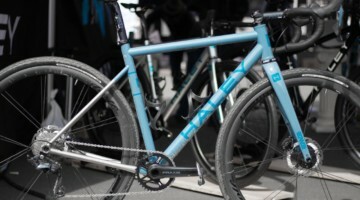 Haidet’s frame is Donnelly Cycling’s carbon cyclocross-specific C//C. 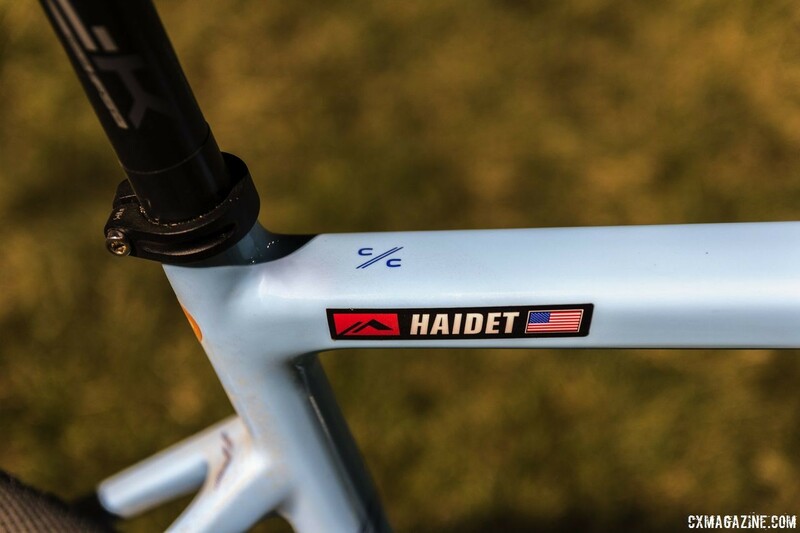 Launched for the 2018 season, the frame is the first to bear the Donnelly name and sells for $1,999 as a frameset in the same Amy D. blue as Haidet’s bike. 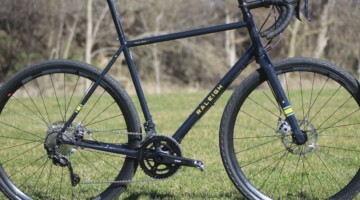 With clearance for up to 40mm tires, 12mm thru-axles, a BB386 bottom bracket shell, internal cable routing and flat mount brakes, the bike checks all the boxes for a modern cyclocross frame. 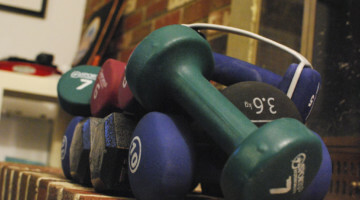 FSA, a team sponsor, provides the majority of the bike’s components. The seatpost, stem and handlebar come from the brand’s SL-K line as does the BB386 compatible crank with 46/36t chain rings. Bar tape is also sponsor-correct in the form of FSA Powertouch in a bright safety yellow. FSA does not (yet) produce saddles, and so Haidet rode a Specialized Power saddle. 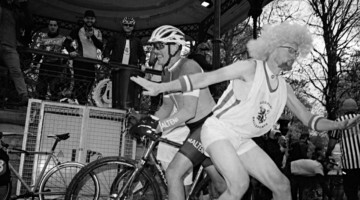 His pedals were the Shimano XTR M9000 SPD model. Wheels came from FSA subsidiary Vision, who provided Metron 40 carbon tubular wheels. 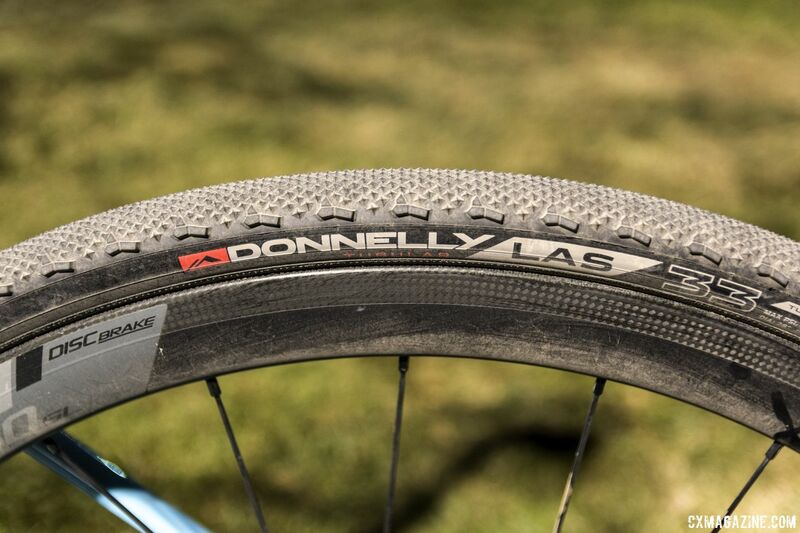 Unsurprisingly, Haidet’s tires were Donnelly branded. In Reno, he chose the LAS file tread for the Rancho San Rafael grass and inflated them to 24.5 psi front and 25.5 psi rear. Haidet’s groupset is the most interesting part of his RenoCross build. 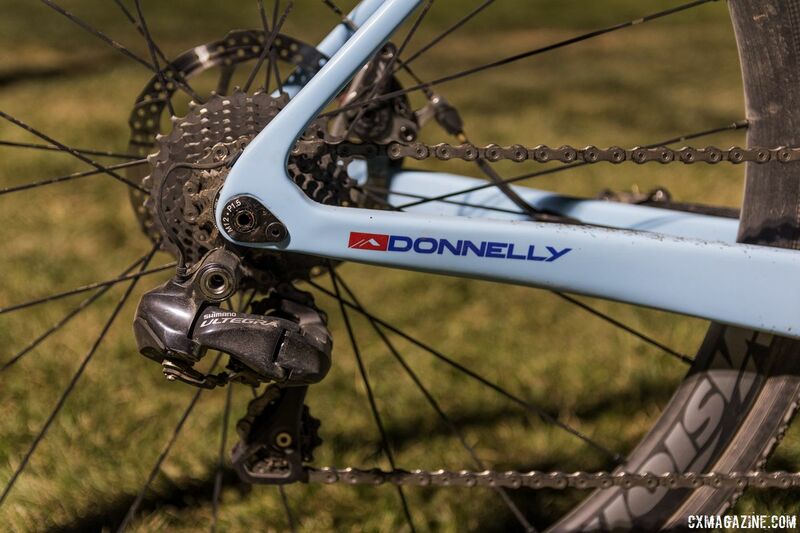 While Donnelly will be using FSA’s WE electronic group for the majority of the season and Haidet had access to what appeared to be a production-ready group at Sea Otter, his bike was equipped with Shimano Di2 in Reno. The temporary transmission used the older-model Ultegra 6870 shifters and derailleurs. 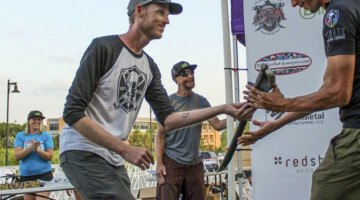 Haidet’s choice for brakes marked a departure from what he ran at Sea Otter. 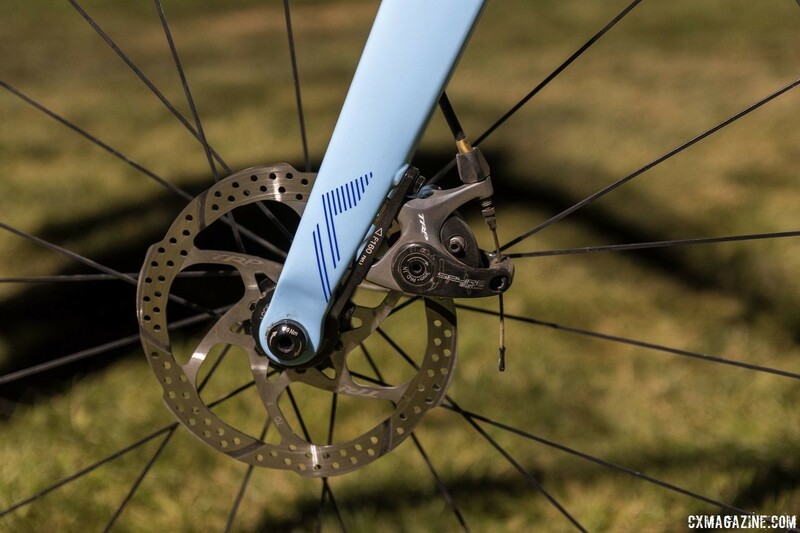 Although the FSA WE groupset includes flat mount hydraulic calipers, Haidet used TRP Spyre SLC mechanical brakes paired with the Ultegra 6870 shifters. 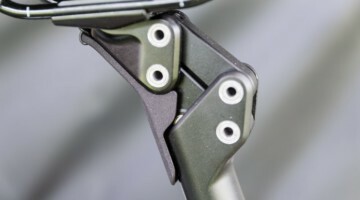 The Spyre SLC model features the same piston actuation as other models but substitutes a carbon cable yoke for a reported lower weight and better feel. We run down Haidet’s Donnelly C//C in the specs and photo gallery below. We will be keeping our eyes out for the FSA K-Force WE groupset on his ’cross setup.